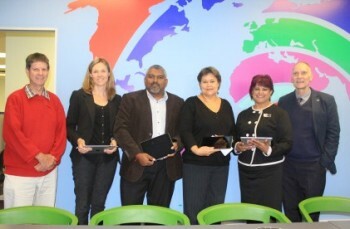 iPads have become the latest learning tool at the Durban University of Technology. Last week DUT, in collaboration with CORE Group SA, launched the iPad Zone, a state of the art facility which aims to enhance e-learning as well as the student learning experience at the University. Core Group represents some of the world’s premier professional and consumer technology brands in Sub-Saharan Africa. Situated on the on the second floor of the BM Patel Memorial Library, DUT ML Sultan Campus, the facility comprises of 15 iPads and is designed to help students change the way in which they think and learn as well as strengthen the University’s e-learning strategy. Professor Graham Steward, e-Learning Project Co-ordinator in the Office of the DVC: Academic at DUT, said the University’s Library Services is leading a future where students will access information online. “DUT libraries are in the forefront of making information available and bringing the world virtually in the palm of our hands. DUT Libraries introduced e-books, loans for student laptops and now the iPad Zone. I have no doubts that students will have access to hosts of educational material and I’m so excited. This is a huge advantage for our students,” he said. This initiative was made possible by the CORE Group SA, in partnership with DUT Libraries. The project aims to empower universities and schools in South Africa to integrate technologies with the teaching and learning process. Lisa Botes, CORE Group Educational Manager said she is confident that the facility will enrich teaching and learning for students and academic staff. She said the iPad Zone will make learning fun and interactive. She spoke about the Group’s plans to provide training representatives to help change the way teaching and learning happens at the University, adding that that the Group remains committed to playing a vital role towards ensuring that the higher education and training sector overcomes its challenges. “We think there’s a huge role to play to deal with the broader challenges faced by the higher education. We commit ourselves to providing DUT students and staff with this technology,” said Botes. Lucille Webster, Director of Library Services at DUT said her unit hopes to extend the iPad Zone to other campuses. Pictured: Greg Bass, DUT Health Sciences Faculty Deputy Dean; Lisa Botes, CORE Group Educational Manager; Sagren Moodley, DUT Library Services IT, Innovation and Development Manager; Lucille Webster, DUT Library Services Director, Shirlene Neerputh, Academic Services Manager at the DUT BM Patel Library and Prof Graham Steward, e-Learning Project Co-ordinator in the office of the DVC: Academic during the launch of the iPad Zone at the DUT ML Sultan Campus.